Home » News » ALTERNATIVE… in a nutshell! 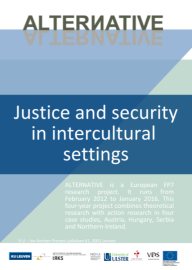 These briefs are mostly based on one of the publications resulting from this project, the manual ‘Restorative Justice Responses to Conflicts in Intercultural Settings: Practice guidelines‘ published in 2015 by the European Forum for Restorative Justice. Visit the ALTERNATIVE Films Online Platform to download the e-book of this manual (and to watch the films produced during this project!) and visit the ALTERNATIVE website to read more deliverables!